The measured normalised fiducial differential cross-sections as a function of pT is compared to predictions from three theoretical predictions combined with various parton shower simulations. Whether you’re searching for new physics or testing the latest predictions in quantum chromodynamics (QCD), direct measurements of the kinematics of the top quark and the top-antitop (tt̅) system are vitally important to particle physics. In recent years, results from the ATLAS experiment have directly challenged the predictions from QCD at Next-to-Leading-Order (NLO) by showing that, at collision energies of 7 TeV and 8 TeV, nature prefers top quarks with a smaller transverse momentum than our theory predicts. 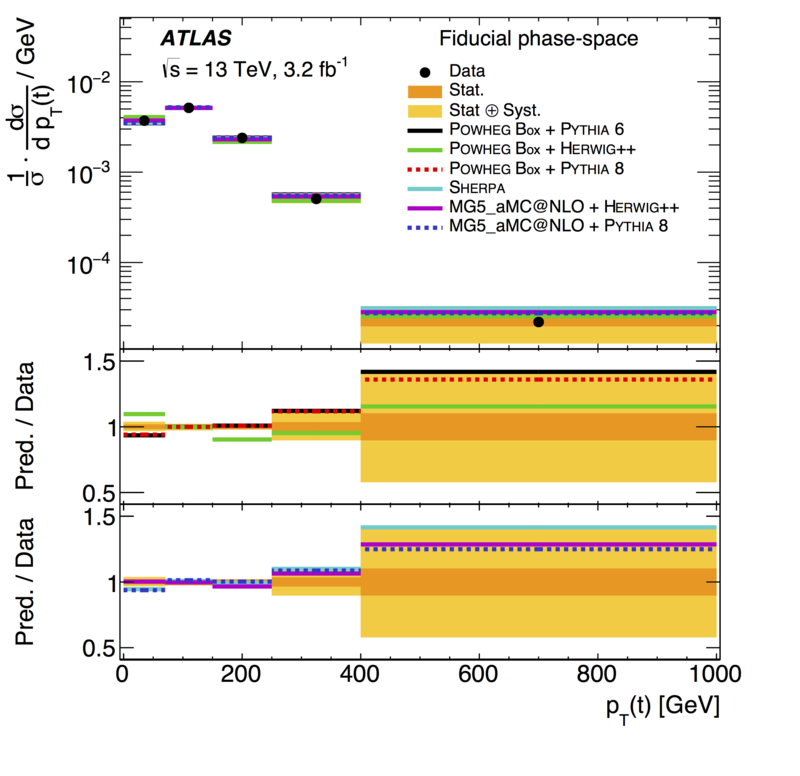 Now ATLAS physicists are asking: is this also the case at 13 TeV? For the first time, ATLAS has measured the kinematics of the top quark and of the tt̅ system in 13 TeV events containing two charged leptons, two neutrinos and two jets (called “dilepton” events). Dileptonic events are extremely useful because they are very easy to identify experimentally and have low background signals from other decay processes, thus giving a very clean signature with which to measure tt̅ events. However, reconstructing the top and the tt̅ system from these events is very difficult because, although the two charged leptons and jets from the tt̅ decay are easily identified and measured, the two neutrinos escape ATLAS without being detected. In this latest analysis from ATLAS, a technique called “neutrino weighting” is used to correct for the missing energy and momentum from these neutrinos. This allowed ATLAS to perform the first full reconstructions and measurements the top and tt̅ system in the dilepton channel. These are also the first 13 TeV measurements of these observables to be published by ATLAS. These new measurements are compared to predictions from Monte Carlo simulations and confirm the findings from lower collisions energies, namely that predictions at NLO in QCD are not sufficient to describe the kinematics of the top or tt̅ system. In particular, the measured transverse momentum of the top quark shows that our predictions are higher than what we observe in the data. These results provide intriguing prospects for the search for new physics. If there are new, previously undiscovered heavy particles, then there is a good chance that they could decay to tt̅ pairs. Dileptonic tt̅ events are unique in that it is possible to use them to measure, with high precision, the properties of the top quark – properties that could be modified or distorted by new physics and that are not easily accessible in other decay channels. Now that ATLAS can measure the kinematics of the tt̅ system, in particular its invariant mass, physicists have a new way to search for previously unknown particles. New physics could be hiding just around the corner and, with this analysis, ATLAS could be one step closer to finding it.